Teen Texting Soars; Will Social Skills Suffer? The number of teenagers who say they text-message daily has shot up to 54 percent from 38 percent in just the past 18 months, a new report finds. The typical American teenager sends 50 texts a day. Teachers worry the texting trend will hurt their students' interpersonal communication skills. The typical American teenager sends 50 texts a day, according to a new report by the Pew Research Center's Internet and American Life Project, and the University of Michigan. For America's teens, cell phones have become a vital social tool and texting the preferred mode of communication, according to a new poll by the Pew Research Center's Internet and American Life Project. 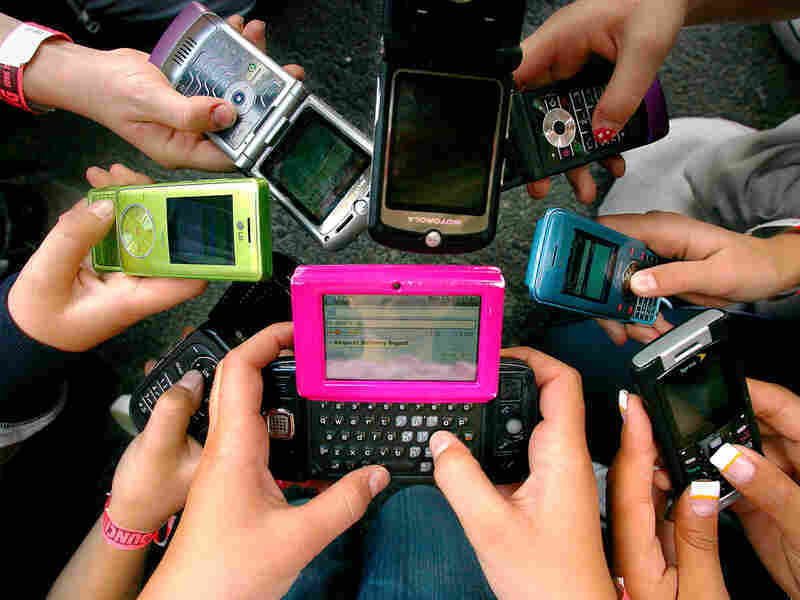 The report finds that 75 percent of teens between the ages of 12 and 17 now have cell phones, up from 45 percent in 2004. And the number who say they text-message daily has shot up to 54 percent from 38 percent in just the past 18 months. "There's now an expectation that teens will contact each other via text, and they expect a kind of constant, frequent response," says the Pew Center's Amanda Lenhart, one of the study's authors. The survey, which was conducted with scholars from the University of Michigan, finds the typical American teen sends 50 texts a day, and a sizable number send double that or more. Some teens text their parents, though most youngsters say they prefer to speak with them by phone. This rapid rise in texting has led to confrontation as parents and schools try to control cell phone use. The report finds that parents are trying a variety of ways, from monitoring content to limiting the time of day or number of minutes children may talk or text. Many parents surveyed -- 62 percent -- say they've taken away their child's cell phone as punishment, though Lenhart says this can backfire: Parents often give children cell phones to keep track of their whereabouts, and don't like giving up that easy access. At Bethesda-Chevy Chase High School in Maryland last week, students were tapping away on their phones before they even reached the exit doors after classes let out. Sierra Koenick, 17, said she and her friends talk about "everything." "What's going on, or meet me here, or something," she said. Then she added, laughing, "Usually they're dumb texts, not even worth it." The percentage of teenagers who have used text messaging to contact their friends daily since 2006 has skyrocketed. Koenick says her grandfather once analyzed her monthly bill and estimated that she sends 300 texts a day. In front of school, junior Daniel Epstein and his girlfriend lounge on the steps, each with a cell phone at their fingertips. Epstein says he once tried to limit his texting by keeping his phone on silent. But when he checked messages at the end of the day, he had 10 from a friend who desperately needed a computer password. "So sometimes there's really something urgent that you have to respond to," Epstein says. Surely, a dilemma that many an office worker with a crack-berry can identify with. The Pew report finds that most schools ban texting in class, but allow it in the halls or at lunch. A small minority ban phones outright, but the study finds that neither that, nor parental controls, seem to have much influence on the amount of texting teens do. A typical teenager sends about 50 texts per day. At schools where cell phones are forbidden, 58 percent of students with mobile phones say they've sent a text message during class. In Los Angeles, Harvard-Westlake High School considered an outright ban last year. Nini Halkett has taught history there for two decades and laments the bad spelling and writing that seems to worsen as texting becomes more widespread. As her students are increasingly immersed in texting, Halkett also finds them increasingly shy and awkward in person. "They can get up the courage to ask you for [a deadline] extension on the computer," she says. "But they won't come and speak to you face-to-face about it. And that worries me, in terms of their ability -- particularly once they get out in the workplace -- to interact with people." At Bethesda-Chevy Chase High, several students -- -- some who embrace texting and one who says he avoids it -- voice the same concern. As in Pew focus groups, the teens admit they use texting to avoid confrontation or uncomfortable situations. "We heard from teens who said, 'When I want the yes, I'll go to the phone because my parents can hear my voice, and I can wheedle and charm them, and that's how I'm going to get what I want.' "